Insanely yumminess happened! These are so addicting, the most addicting cookie I have ever made! 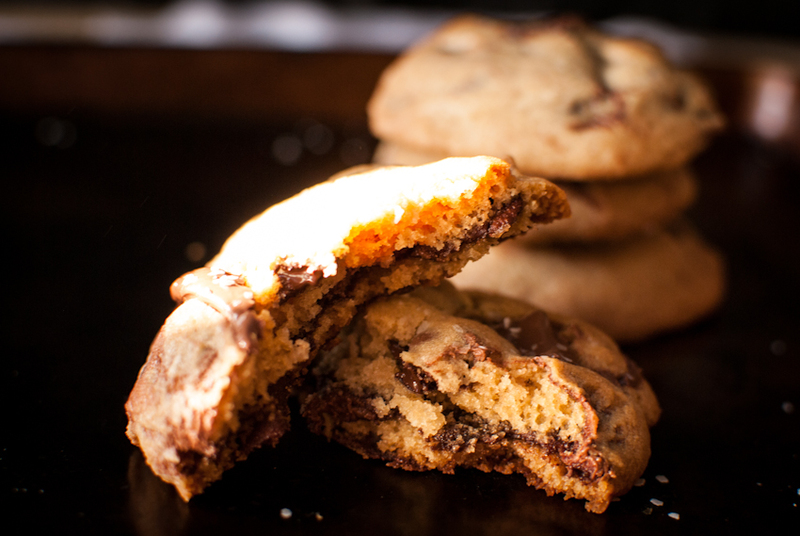 There is just something about a warm homemade soft chocolate chip cookie, it’s pure joy in a cookie. 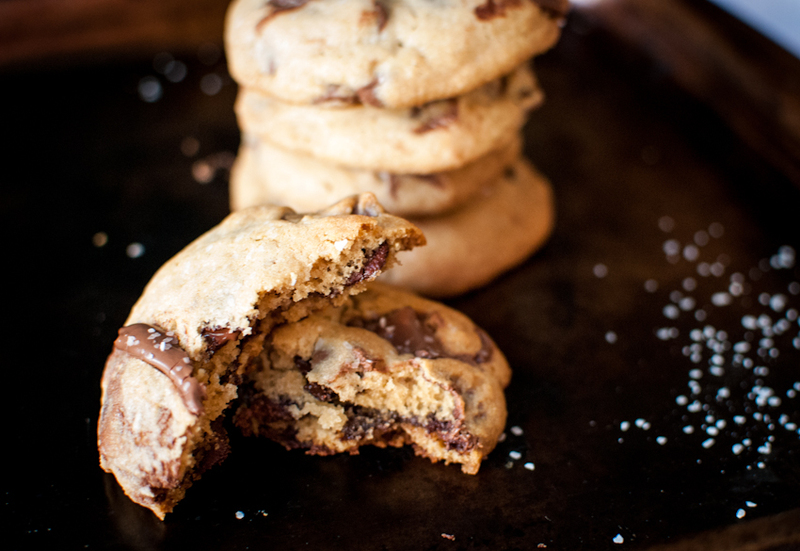 Then imagine biting into that with a gooey Nutella filled center…whoa!! Some serious flavors there, a giant party in your mouth, all the taste buds are doing the happy dance!! And to end that happy dance on a happy note, I sprinkled some sea salt on top right before going into the oven. Pure chocolatey, salty bliss! I did learn a few things though… first off, Nutella does not freeze! It’s also to soft to work with right out of the jar, so I put the jar in the freezer anyway, to chill it as cold as possible. Then after rolling a small amount inside my chocolate chip cookie dough, I chilled the dough on a cookie sheet for 30 minutes before baking. I didn’t want my cookies to be flat with soupy Nutella all over the pan. I don’t take my baking failures very well and I do cry over spilled milk…that’s just how I roll! Place the jar of Nutella in the freezer for 30 minutes. In a large mixing bowl, mix the butter and sugars together on medium speed until well combined. Add the egg and vanilla and mix for 30 more seconds. Next add the flour, baking powder, baking soda and salt, mix just until combined. Remove Nutella from freezer, scoop a teaspoon full of Nutella and form into a small ball. Wrap a tablespoon of cookie dough around the nutella forming a ball. Place cookie dough balls on a parchment lined cookie sheet and chill in the fridge for 30 minutes. 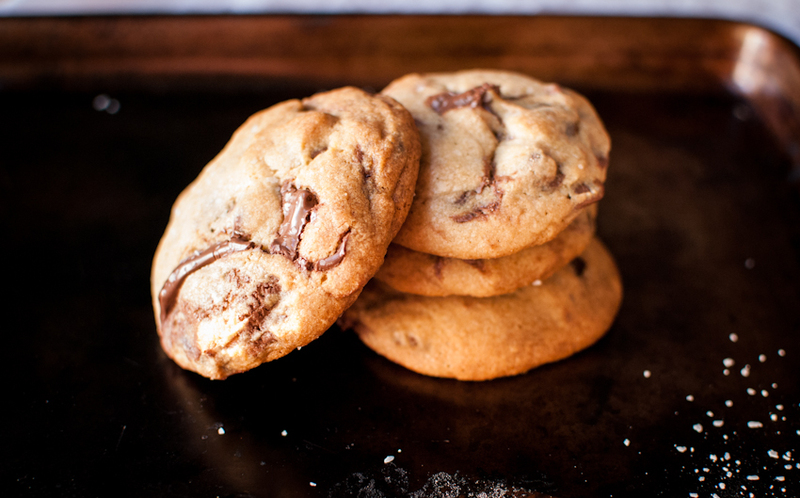 Heat oven to 375 degrees, remove cookie dough from the fridge and sprinkle with sea salt. Bake for 10-15 minutes until cookies are set. Cool on a wire rack.